Kay Wright Lewis, A Curse upon the Nation: Race, Freedom, and Extermination in America and the Atlantic World. University of Georgia Press, 2017. “From the inception of slavery as a pillar of the Atlantic World economy, both Europeans and Africans feared their mass extermination by the other in a race war. In the United States, says Kay Wright Lewis, this ingrained dread nourished a preoccupation with slave rebellions and would later help fuel the Civil War, thwart the aims of Reconstruction, justify Jim Crow, and even inform civil rights movement strategy. And yet, says Lewis, the historiography of slavery is all but silent on extermination as a category of analysis. Moreover, little of the existing sparse scholarship interrogates the black perspective on extermination. A Curse upon the Nation addresses both of these issues. “To explain how this belief in an impending race war shaped eighteenth- and nineteenth-century American politics, culture, and commerce, Lewis examines a wide range of texts including letters, newspapers, pamphlets, travel accounts, slave narratives, government documents, and abolitionist tracts. She foregrounds her readings in the long record of exterminatory warfare in Europe and its colonies, placing lopsided reprisals against African slave revolts—or even rumors of revolts—in a continuum with past brutal incursions against the Irish, Scots, Native Americans, and other groups out of favor with the empire. 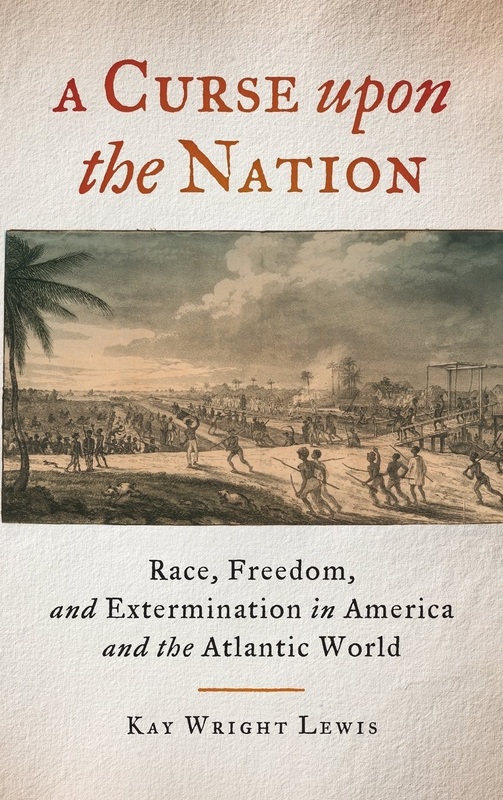 Lewis also shows how extermination became entwined with ideas about race and freedom from early in the process of enslavement, making survival an important form of resistance for African peoples in America.